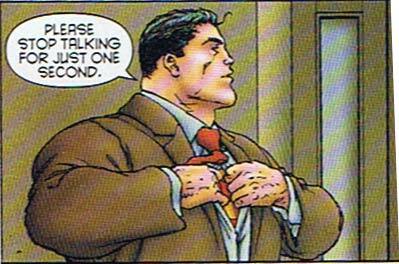 Yeah, Quitely draws Clark as really beefy and oafish. Superman’s pretty thick, too. It’s an unusual illustration style, but it really works well here, it gives everything a very unique feel and sets it apart from the hyper-realism that’s sort of taken over the mainstream super-hero comic. Lois is gonna pull out a kryptonite laced frying pan and beat the crap out of him. Hmmm… I knew a friend who tried saying that once… The good news is that the doctors say he showed signs of brain function this morning, so they’re not gonna pull the plug yet. Hey, he looks kind of like Superman with his glasses off. Huh. I guess yeah. Acctually no.Yeah, no, yeah, no,yeah, no, yeah, no, yeah, no, yeah. Right, like I’m sorry. People say I’m like Viky Pollard! Like yeah, right. I’m not a big fan of how he draws Clark and Superman in this….I mean, even in the comic they can’t belive that they re the same person…even when Clark takes off his business suit to reveal his costume…Either he draws them THAT differently, or secretly All-Star Superman takes place on a world similar to that of Bizzro, but STUPID! This clarke is either Mr. Universe style muscular or very chubby – he has no neck! Maybe it’s just me, but Quitely seems to draw everyone like an over inflated blow up doll. And invulnerable won’t help. With his hearing, he will literally never hear the end of this.